If you are booting in to Fedora first time then this two part of the software doesn't available for users just in english. Could we get POT files into Transifex? Can you attach pictures of the screens in question? Not needed, because this is part of the Media check. Sorry for the bad expression. 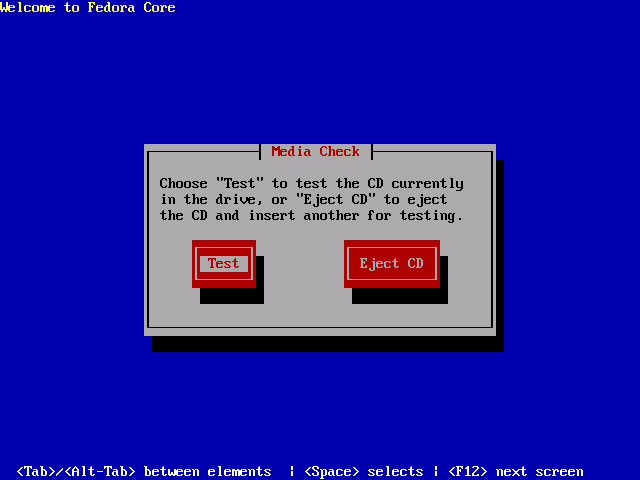 (This is still the same program what I have found in google from older FCore: http://www.labtestproject.com/files/linuse/images/f4-big/003-testing-start.png) So, when you're entering to test the written disk is THAT UI is only english. Is it possible to translate it, and use it as could be red by anybody? Also may be this could include also the very first grub boot menu too? I know this is tiny little pieces of the distribution, but this could make it much nearer to the users. What do you think? Could we have an POT file to these parts? Or is any way to trigger to another language this part? If we're booting off the boot.iso, don't prompt for lang or kbd (#457595). Note that this bz is for Live, which is probably ok, but bug #619410 is not. At the beginning of stage2 yes - but this is a stage1 bug. but I think the framebuffer usage was reverted before the final release? Maybe it will return for F18? AFAIK the only thing which was reverted is using theme. But international support shoulf still be there. This interface is no longer in anaconda.